Last month, I did a review of the cookbook, The Vegetable Butcher. Today I'm sharing a quinoa and asparagus recipe inspired by one of the recipes in the book. 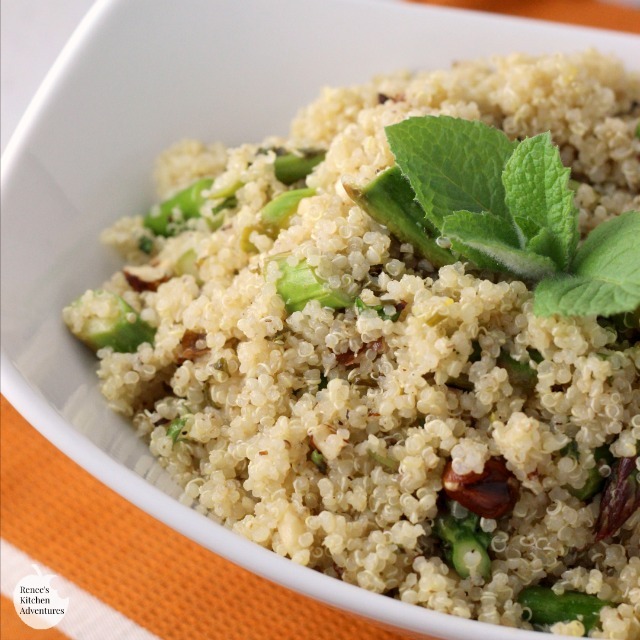 Lemon Vinaigrette Quinoa with Asparagus, Hazelnuts, and Mint makes a wonderful healthy side dish or vegetarian main dish that is sure to please your family and friends! Ever since my son became a vegetarian, we've eaten a lot more interesting grains in this house. I'm no stranger to quinoa and I hope you aren't either. It's one of the few grains that is also a complete protein, which translates to "really good for you!" It's very easy to cook (just like rice!) and it has a nutty taste and a chewy bite to it. We really like it. Like rice, it is kind of bland on it's own. That's why I like to serve it in dishes like this one, which is full of flavor! Asparagus is a great addition to the dish, adding flavor and texture. The hazelnuts give it more flavor and a nice crunch! If you don't have hazelnuts, substitute walnuts instead. The lemon vinaigrette makes a tasty dressing for the dish. This dish can be served warm or at room temperature making it a great choice for pot lucks! You don't have to be a vegan or vegetarian to enjoy it either. It goes great with grilled chicken for an easy summer meal! This quinoa and asparagus recipe finds it's way on my menu often and I feel really good about serving it to my family. It's wholesome and delicious and even my picky husband loves it! I hope you give it a try. 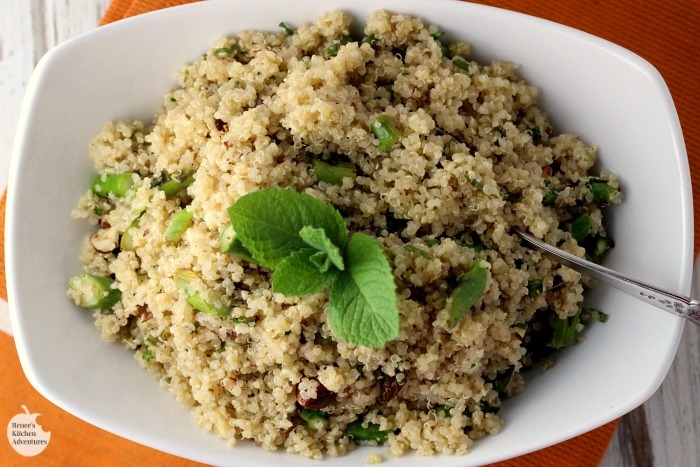 A lovely spring/summer quinoa side dish or vegetarian main dish with the flavors of lemon and mint. Heat medium skillet on med heat. Spray with cooking spray or add 1 tsp. olive oil. Saute asparagus until crisp tender, about 5-6 minutes. Remove from heat and set aside. Make Lemon Vinaigrette: Combine all ingredients with whisk in large bowl except olive oil. While whisking, drizzle in olive oil and whisk until it comes together. 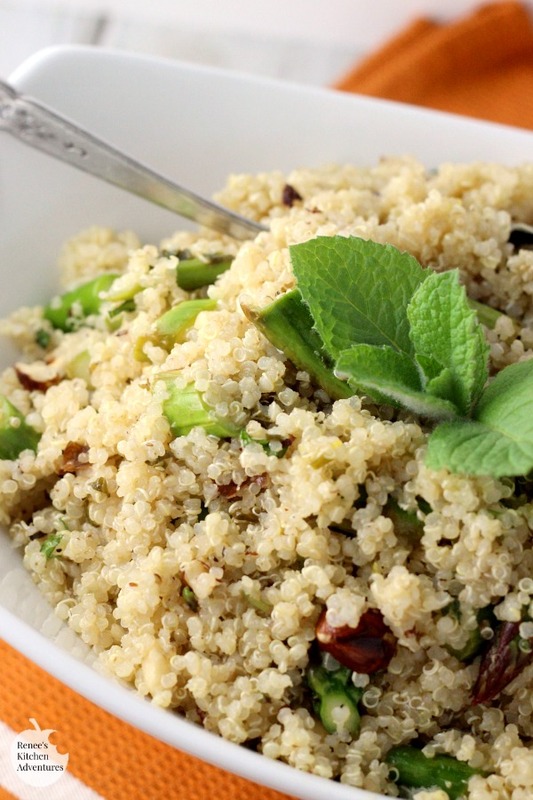 Add quinoa, cooked asparagus, hazelnuts and mint leaves to the vinaigrette and stir to coat. Taste for salt and pepper and adjust as needed. Serve warm or at room temperature as a side dish or vegetarian main dish. Interested in more recipes from The Vegetable Butcher? 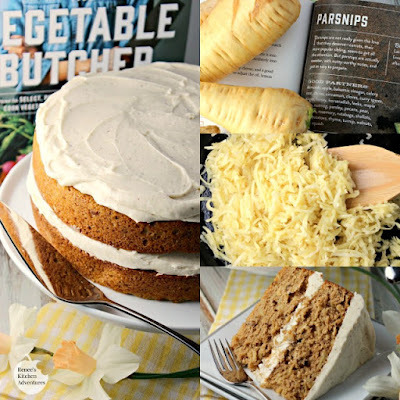 Check out this Parsnip-Ginger Layer Cake! Both of my kids have 'attempted' to become vegetarian, but failed. But they and I, continue to include more meatless recipes in our nutrition. I'm a freak about rice and quinoa too, so this would be a winner in my family! Thanks for sharing this, Renee! He's been going strong for about a year now. I admire him. I couldn't do it. lol I think you'll love this recipe! Oh My! 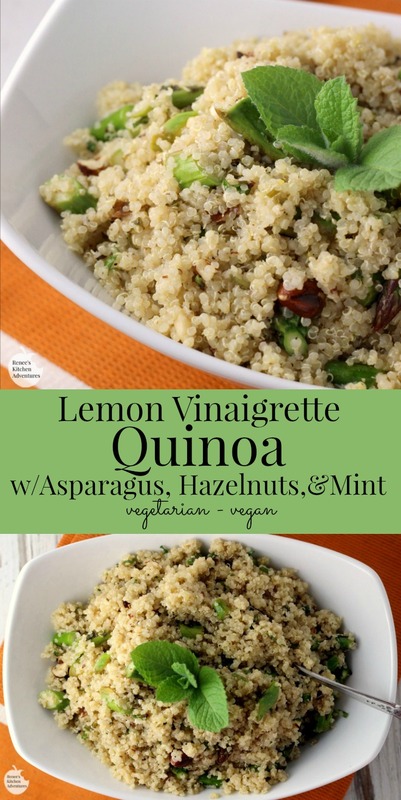 I have always wanted to try lemon and quinoa. This looks so very delicious. Give this one a try! I think you'll like it! Thanks Rini!